The aim now is for students to continue developing and programming the Vex Robotics system ready for next year. Four of KGS's Technology Challenge students attended a Vex Robotics Regional Competition for the first time in January, scored the joint highest points of all the 33 qualification matches and won ‘Best Robot Design’ as awarded by the judges. Vex Robotics originates from the USA but has expanded over the years and now attracts over 9000 international teams. 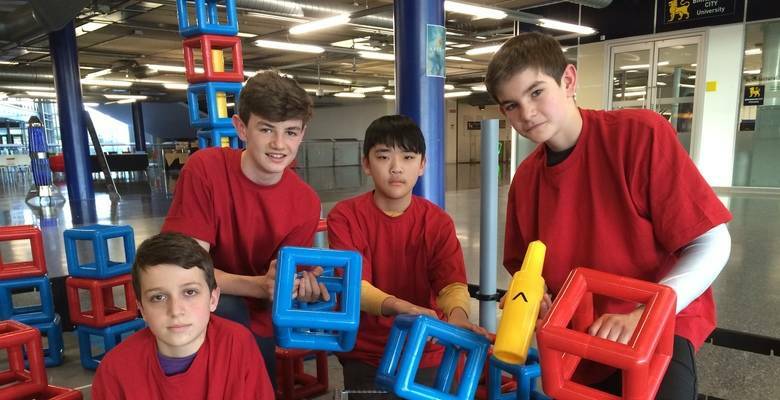 The challenge is different each year and for the 2014 to 2015 season the aim is to build towers called ‘Skyrise’ sections and load coloured cubes onto them to gain as many points as possible. There were 14 participating teams at the regional event at the Birmingham Think Tank Science Museum on Wednesday 28th January, and Kingston Grammar School were the only newcomers to the competition. The students competed in 14 knockout matches and often found themselves sitting in 3rd or 4th position. Although they only just missed out on qualification to the National Championships, the students and robot performed fantastically and were very excited to win the ‘best robot’ award. Very well done to the Technology Challenge students Nathan Farr, Joshua Lee, Alex Gavrilescu and Callum Farr.